"We are not pals, we're not getting married, we're not going to take long moonlit walks together, okay?" Whether he's playing Sonny Corleone in The Godfather, Frank in Thief or Paul Shelden in Misery, James Caan pretty much always plays James Caan, and the success or failure of his characters has more to do with how he relates to his costars than his own performances. For the 1984 feature Alien Nation, which spawned a popular TV series and five TV movie sequels, Caan is paired with Mandy Patinkin (veteran of The Princess Bride, Sunday In The Park With George, Yentl) and placed under the direction of Graham Baker (Omen III). Though the feature is generally regarded as inferior to the television series it inspired, it does have its own merit, as long as you aren't looking for a real science fiction film. It is 1991, three years after the first alien ships have arrived on Earth, carrying with them a race who were genetically engineered to be slaves. Highly adaptable and very quick to learn, they readily began assimilating into the world of humans. The "newcomers" are now infiltrating all levels of society, much to the displeasure of Earth's native population, who view them as unwelcome immigrants to their land. One of those who dislikes these "slags" is Detective Sergeant Matthew Sykes (James Caan), separated from his wife, and bitter about the state of the world now that the aliens are here. He is grudgingly assigned to the alien slums known as Slagtown, but despite his bigotry, when his partner is killed by newcomers during a suspected robbery, he decides to volunteer to team up with the first alien detective, Samuel Francisco (Mandy Patinkin) who Sykes prefers to call George. Though they are not assigned to his ex-partner's murder case, Sykes hopes that George can help him uncover his killer, as the pair begin investigating a newcomer murder sharing some of the same ballistics details. As more information is uncovered, the links between the two cases gets stronger, though Francisco fears that elements from his people's past may be reemerging here on Earth, something that he desperately wants to stop, as it could threaten the newcomers' already limited acceptance here in their new home. Though the payoff is missing in the end, Caan and Patinkin do turn in great performances, and despite a less than spectacular resolution, the ride is worth the investment. The chemistry between the two leads carries the picture, though it feels more like a movie-of-the-week than a feature. The humor level is decent, with enough little jokes along the way to provoke the occasional chuckle. This is not in any way a science fiction film, despite having an alien as the co-star. This is a fairly typical "renegade cop gets new straight laced partner that he doesn't like, then end up becoming pals" story, and as such works quite well—ignore the potato heads and you could have any number of cop buddy films. What Alien Nation fails to do is use its interesting premise for anything more than a setup and a way to establish racial prejudice. Though a lot more could have been done with this idea, if you accept the film for what it delivers you get a fairly action-packed adventure with cops chasing down bad guys. If you enjoy James Caan, you'll probably like it, if not, as the tagline reads, prepare yourself. Image Transfer Review: Like the two other films Fox released in this wave of science fiction film, the anamorphic image is well presented, and from a relatively clean print. Grain is visible, though natural looking and black levels are solid. Colors are well presented with only strong reds showing any sign of bleeding. This is the first time this film has been available in its proper aspect ratio on home video, and it holds up well here. Audio Transfer Review: English audio is available in Dolby Digital 4.0 and Prologic surround. The sound field is emmersive, with decent directionality throughout. Dialogue sometimes suffers due to activity in the surrounds, but for the most part is easily discernable. A French surround track is also provided. Extras Review: Though not loaded, at least there are some extra materials to supplement the feature. A 6m:42s promotional fluff piece features on-camera interview clips with the cast and director. More interesting is a 3:40s behind the scenes featurette that puts us on location, witnessing the rehearsals for a pair of the scenes shot for the film. The theatrical trailer and three TV spots are here in full frame. Trailers for Aliens, The Abyss, Enemy Mine, Independence Day and Zardoz are collected in the Fox Flix section. 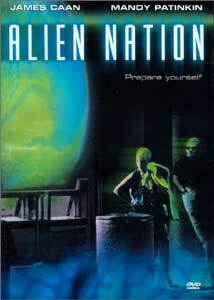 While not exploiting the science fiction premise used for the film, Alien Nation still delivers a solid cop/buddy movie due to strong performances by James Caan and Mandy Patinkin. If you're not a Caan fan, this is a pass, but I found it more enjoyable than I was expecting. The DVD is well presented with a solid transfer and good audio.